i like these kind of mornings, waking up to see some piece of breaking news on television. apparently the transfer of sovereignty from the US coalition to iraq happened today, 2 days earlier than the scheduled day. it caught a lot of people by surprise and i personally think it was a brilliant move on the part of the administration (oxymoron). any potential terrorist attacks to coincide with the handover have been thwarted for the time being, and possibly any sort of domestic demonstration have been thrown for a loop as well. too tired and hungry to go out running today (i ran yesterday anyway), i went to the cmart to get some chinese groceries, came back to the office to drop everything off, then went back out to get my lunch, some salt & pepper pork ribs from the chinatown eatery. it's of an inferior quality compared to what i get at chinatown cafe, but it's a lot closer and i didn't want to go very far. it's not a very healthy meal either, fried pork cutlets and i could tasted the MSG. the chinatown eatery was actually pretty crowded today, for a small greasy spoon food court, it was actually kind of pleasant with the air conditioner running and a few wall mounted rotating fans. the final few hours of work was painful. i tried going to bed early last night and i got 7 hours of sleep, but i'm still struggling to stay awake. i sit by the far end of the office with my back turned to everyone so nobody notices if i close my eyes and briefly doze off. i'm tempted to go out one of these days when it's a really nice afternoon and catch some zzz's in the park for an hour before returning to work. not sure if that'd be more less tired or more tired, but it would fulfill a dream of mine to sleep out in the public like a homeless person. i took the subway to davis square and walked to pemberton farm on mass ave, looking for coyote urine. the farmer's market portion of the store was filled with the prettiest and healthiest people i've ever seen, women with their yoga bodies and halter tops, men with their biker legs. and there i was looking for coyote pee. the stuff they carried was the same brand i saw at ace hardware, except here it was $2 cheaper. unfortunately they only carried a fox/bobcat blend which is only good for borrowing rodents. so i walked back to davis square, took the train one stop to porter square, heading straight back to ace hardware. "tony! tony!" i heard somebody calling my name. i did that 360 degrees pan when you're not sure who's calling, and from across the street i saw renata's friend erin hanging out the side of her car. we chatted briefly, erin was waiting for renata, who was in the supermarket getting some dessert, and they were going to hang out with another friend of there's who coincidentally live on my street. 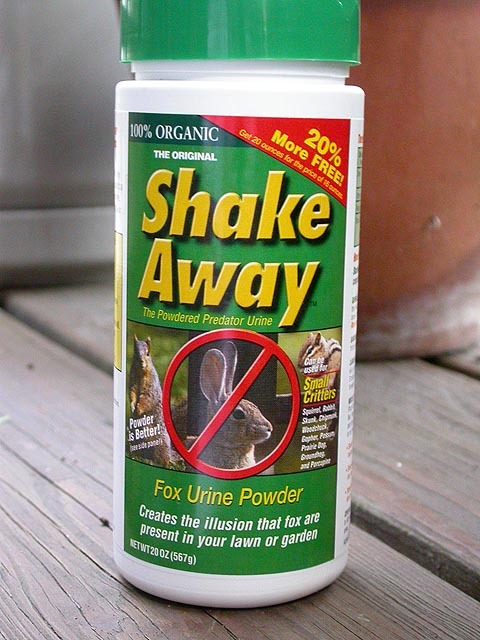 i didn't bother to wait for renata to come back out, and went to the hardware store to get my urine (they carried fox, which will work, coyotes aren't natural squirrel predators anyway). by the time i came back out, erin's car was gone. a package was waiting for me at home, the replacement digital camera batteries from sterlingtek. they're a different brand than the original batch that i bought back in october (these are "assia" [sic] brand), and they're missing the plastic cap that protects the battery leads, but i'm just happy i'm getting free replacements for the two batteries that went dead. i went into the backyard, eager to put the fox urine to good use. i noticed that squirrels had dug at my parsley container. no matter! now that i have the power of predator pee on my side! i unscrewed the top to remove the "freshness" seal. 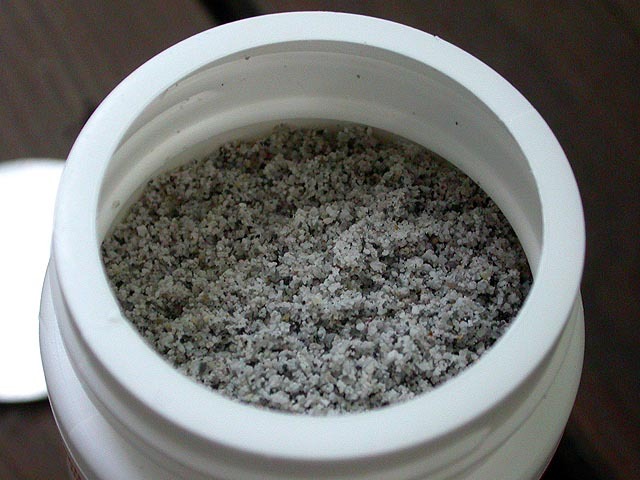 inside, there were clumps of granules that looked like either damp beach sand or road salt. of course i took a whiff. i've smelled liquid coyote pee before, and it's an extremely foul odor. sniffing at this stuff though, powdered fox pee, i didn't really smell anything, it was pretty odorless. will it work? we'll see. 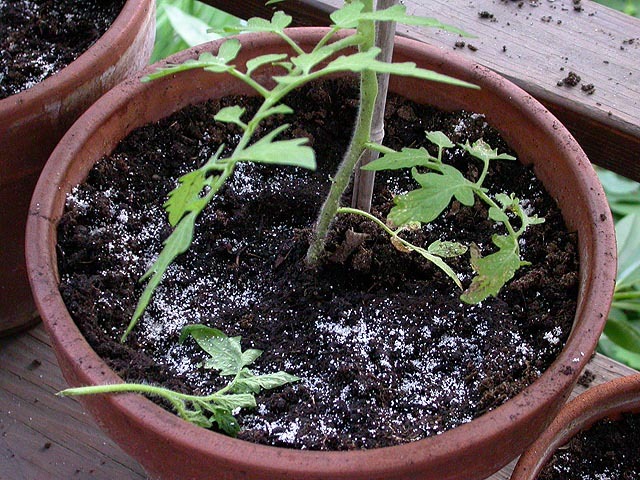 i them sprinkled it all into my potted plants, making sure to get good coverage. i stood back to admire my handiwork, planted some mint into the formerly basil growing pot, then went back inside, where i took a quick shower. i haven't cooked in almost a month, and was determined to do some cooking this week. tonight would've been a magical cooking night, were it not for the fact that i was tired and figured i'd hold off on cooking until tomorrow night, where maybe i can snag one of my lady friends for some thai red curry, an oldie but goodie. i started watching the order (2003) on cinemax, starring heath ledger and shannyn sossamon, a religious themed horror movie. i didn't think it was anything good at first but found myself drawn into the story, about the search for a sin eater looking to find a replacement. before the movie ended though, somebody rang my doorbell. i could already guess who it was, and sure enough, it was renata. her little social gathering across the street over, she decided to drop by, as well as she should; i told her my feelings would be terribly hurt if she was in the neighborhood but didn't come and visit. i was happy she showed up unannounced, because she got a chance to see how messy my house was, since usually she's so amazed by how clean i keep it. confession: i kind of had a feeling she might visit, and although i didn't clean the living room, i did vacuum the bathroom a little bit. we watched some television (nature show, good, nightly news, bad) before she left, having fully redeemed herself once more. approaching 11pm and not having had dinner yet, i went to star market to get some groceries (the first time in a long time) and came back just in time to catch the daily show. i cooked up some dumplings and had dinner while watching some nightline. marlene dietrich - "you're the cream in my coffee"